Introduction: technology seems to be changing everything; Society’s pervasive culture of copying; The role of the academic librarian in combating student plagiarism; How do students and universities view plagiarism? Information literacy frameworks: working towards the ethical use of information by students; Discipline-based approaches to combating student plagiarism; Thwarting student plagiarism through collaborations: faculty-librarian partnerships and beyond; Practical approaches to promoting citation methods and the ethical usage of information; Plagiarism-detection software services and other uses of technology to combat student plagiarism. 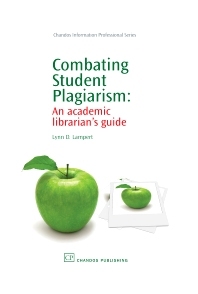 This practical book introduces readers to the current issues facing todays academic reference and instruction librarians grappling with the growing problem of student plagiarism. The book provides up-to-date overviews of student plagiarism, examples of ways in which librarians can educate students through proven instructional techniques, collaboration approaches and outreach methods, and discusses common problems and questions librarians may encounter when incorporating current anti-plagiarism instruction into their instructional services. Topics include: role of the academic librarian in combating student plagiarism, discipline-based approaches to combating student plagiarism, information literacy techniques and faculty/librarian collaboration. Academic instruction librarians, reference librarians, library administrators; Public, special and school librarians, and academic LIS instructors. Lynn Lampert currently serves as the Chair of Reference & Instructional Services and Coordinator of Information Literacy and Instruction at California State University Northridge. She has published and presented nationally on information literacy trends and issues. She currently works with faculty and administrators on the development of university wide curriculum reform and development issues related to student information literacy skills attainment. Prior to joining the faculty at California State University Northridge, Lynn worked as an Information Specialist at California Lutheran University. Lynn received her Masters in Library & Information Science and her Masters in History from the University of California Los Angeles in 1998.